In my last post I mentioned that I had cast on a pair of slippers from a book that I had reviewed, 25 Stylish Knitted Slippers by Rae Blackledge. 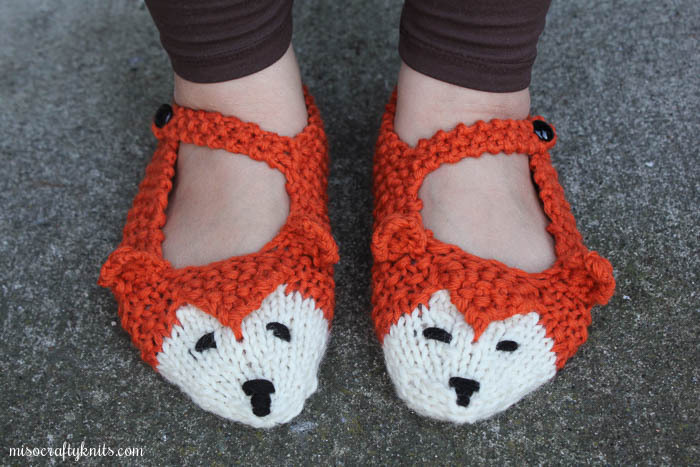 Of all the slippers featured in the book, the Foxy Slippers were the ones that really jumped out at me and demanded that I knit them. Pronto. I figured these slippers would be a quick knit and so I didn't feel guilty for casting them on. I'm pretty sure I needed a break from the other WIPs that I have on the needles...right? Anyhoo, I didn't have any suitable chunky yarn in my stash or colours needed to create the foxy look, and my LYS doesn't carry the yarn brand used in the pattern. Since no one has made these slippers before, or at least, there are no projects listed on the pattern page, I had no idea what yarn I could use as a substitute. I took a chance and decided to use Cascade 220 doubled - as it was the only yarn that I could think of that was within my budget and in a colour I liked. Luckily, this all worked out for me and I not only achieved gauge, but a well-fitting slipper. Yay! 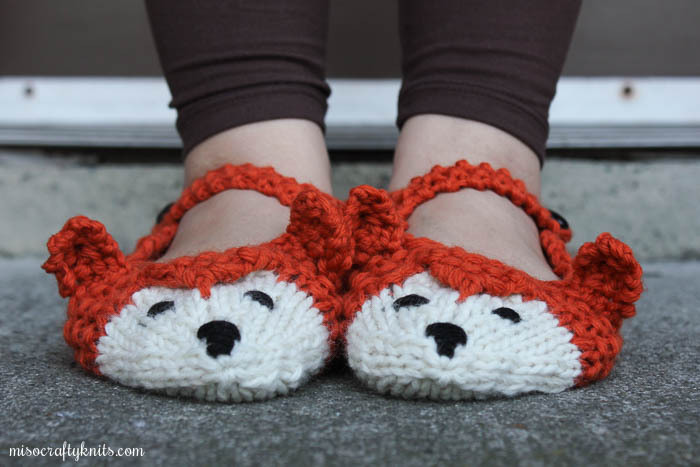 These slippers could easily be whipped up within an hour or two, or broken down and completed over a weekend. I'm a procrastinator, especially when it comes to weaving in ends and seaming, so this project took me a couple of days to complete. Embroidering the faces took me forever to do, as I kept hemming and hawing over whether or not if one of my slippers looked more like a bear rather than a fox. How you embroider a face on could really make or break an expressive knit (especially a stuffie, it really gives them their personality). In the end, I kept the suspicious looking face, as I was reassured on Instagram that the face does indeed look like a fox's. 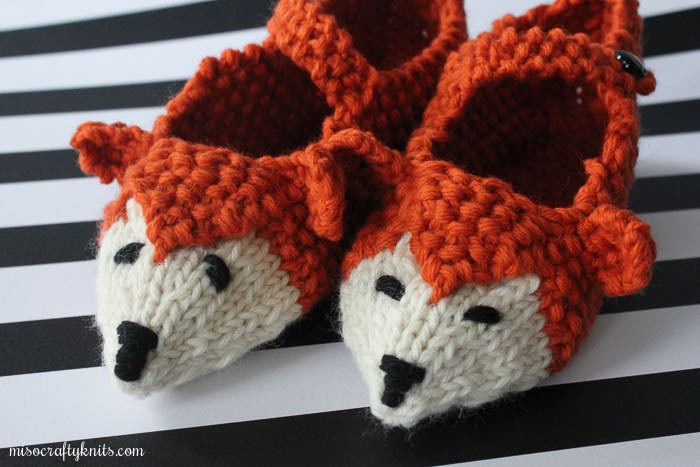 On the other slipper I used only one stitch for the eyes and slanted them down slightly to give them a more foxy look. I think where I went "wrong" on the first slipper was that I used two stitches and slanted them downwards a bit, and in my opinion, this makes them look a little droopy and bear-ish. The pointy noise is what saves the face. I usually dislike having to sew up my knits and worry about having too many ends to weave in on such a small item, but found that the texture of the seed stitch really helps to not only hide any imperfect sewing but also gives plenty of spots for those ends to get woven in to. I surprisingly quite enjoyed weaving in the ends on this project (crazy, I know!! Did I hit my head??) and trust me, there was a lot! There isn't anything I would change about this design. I thought the construction was really clever - you start with the heel flap and then pick up stitches along the sides to start the foot. I have abnormally narrow heels and was concerned that these slippers would just slide off my heels every time I took a step but the straps worn diagonally across the ankles eliminates any chances of slippage and really nips in the heel area, making for a nice snug fit. I have a fair amount of yarn leftover, I think more than enough to make another pair of slippers. Which I think I just might do as I can see myself wearing these to death and would like to have a backup pair for when these bite the dust. Or it would be nice to have an extra pair for when summer rolls around and BBQs and gatherings commence. I always feel weird being bare foot in other people's homes (I'm not a fan of feet and sometimes assume others do as well) so having super cute slippers could just be the answer. Or, I could just be grasping at straws here and am trying to find a reason to knit another pair. Meh. They're too cute. I'm going to knit another pair just because I want to. Knit another pair just because you want to! But also like the for-while-at-other-people's-homes idea as well, which is a good backup excuse for when "because you want to" doesn't seem like a good enough reason to work on it ;) They are adorable, and I love the diagonal/across the ankle strap to keep them on - the style of slipper that they are without that would easily lead to them flying off of feet, but they do look very secure with that strap! oh wow, i love these! Yours turned out so cool. And so good to hear that holding cascade 220 double worked out for gauge, since it's so readily available. I would love to knit a pair for myself and a matching pair for my daughter... another beautiful knit to add to the queue! OMG, those are totally adorable! !